From WENDAMEEN, LIFE OF AN AMERICAN SCHOONER. See Books by Capt. Parker for more information. We were to leeward of the fleet at the start of the 1990 Schooner Race. 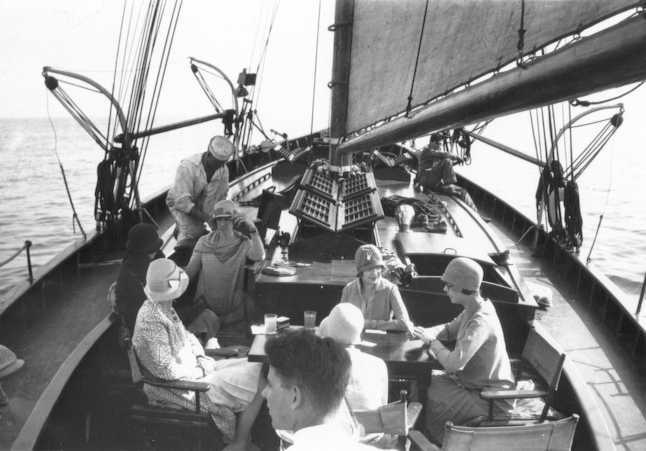 The Wendameen was on her shakedown cruise following an extensive restoration. She had not sailed in 57 years. 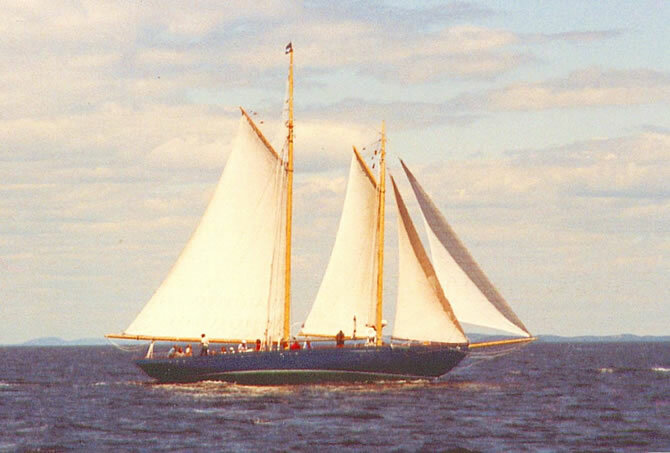 The Wendameen, launched in 1912, was the first schooner designed by the brilliant, yet undiscovered, John Alden. The wind was light sou'west as I tried to work the 67' Wendameen up to a fleet of 22 other schooners. A dark line on the horizon showed a better breeze was fast approaching. Finally it hit us. Fresh from the south and steady. A racing-log entry from 1924 came to life. "The Wendy bows to the breeze like she's tickled to death with it, and off we go like a train of express cars!" She overhauled one schooner after another. Many twice her size. As she flew by, there came cheers from the other vessels as the crews heard the Wendameen's story from their captains. By the end of the race she had danced by most of the fleet. Great boats with skilled captains. The race became the exclamation point marking the end of a four-year restoration that most said could not be done! I first saw the Wendameen when I was a teenager. It was 1974 and she was stored in a shed on City Island. The old girl had not sailed since 1933, but I remember how hauntingly cigar smoke and perfume still filled her saloon, and how the sounds of music and laughter continued to resonate throughout. 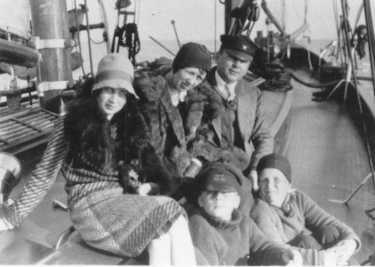 I grew up, moved to Maine, sailed schooners and became a captain. A dozen years went by and I found myself again standing on what was now left of the Wendameen. She was dying on a mud bank in Connecticut. Most of her deck had collapsed from rot, much of the topsides had fallen away. She had no rudder, no engine. Only memories holding together where once bronze, oak and iron did their job. The ghosts were still aboard. I could hear the rush of feet on the foredeck as she came about, curses coming out of the engine-room hatch, and I saw the teeth of a fine wave under her bow as she reeled off the knots... I stared at her, and she looked back with those "take me home from the pound" eyes. I bought the Wendameen that fall. Hiring a small dragger, I tried to tow her to Maine, but after 90 miles, a strong easterly forced us to seek refuge in the Thames River. Just 100 yards from a New London dock, the dragger lost steering. Wind and tide conspired, and set the Wendameen against the pier. I secured her lines and a small voice said, "Wait 'til spring." Shortly after, I discovered that the Wendameen had taken herself someplace familiar. She was berthed less than half a mile from her original mooring and her first owners' home! That was to be one of many coincidences which eventually tied her new life to her past. 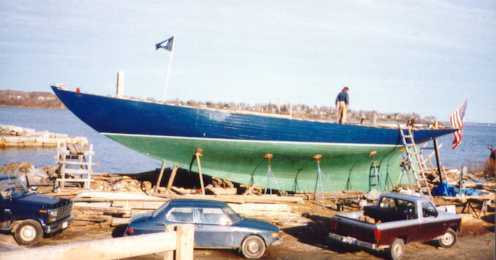 It was close to two years before I raised the money to install the engine and rudder, which finally brought the Wendameen home to Maine. I lived on rice and frozen pizza, drove a car with no brakes and heard hundreds of people say, "Give it up." But a few believed in me—and the Wendameen. 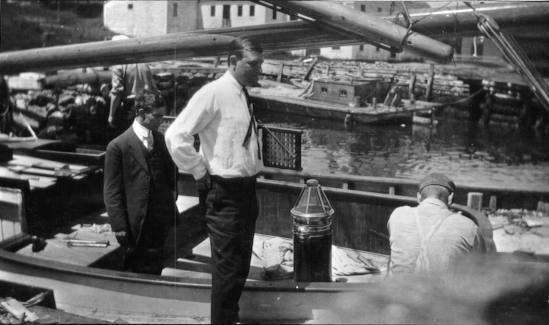 Much support came from descendents of the schooner's early owners. She had played such an important role in the lives of those she touched that generations later, grandchildren and nephews still knew of her. I hauled the Wendameen at Rockland in the fall of 1988, just up the coast from the yard where she was launched years before. I worked alone through the winter, replacing most of her frames. Finally, a bank showed mercy and I was able to hire a shipwright. 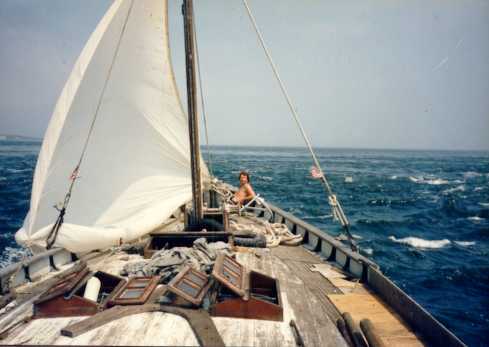 On July 1, 1990, we cast off and set the Wendameen's 2400-square-feet of sail. The new Wendameen was underway! A guest pointed to a forgotten news clipping in the scrap book. The date: July 1, 1912. 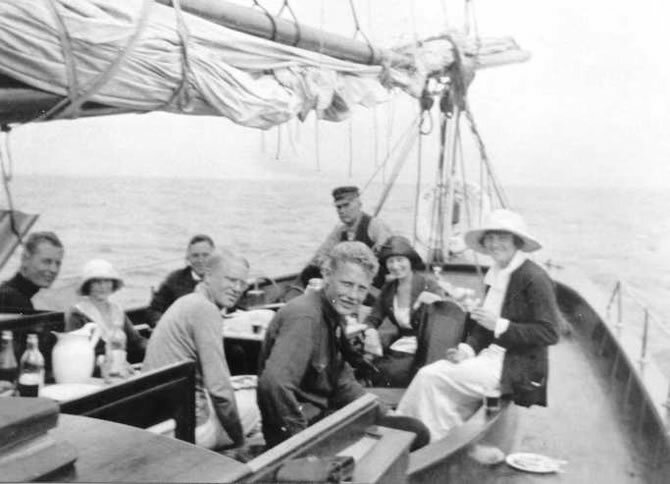 It read: "The new auxiliary schooner yacht Wendameen went into commission this morning, her owner and party aboard..."
THE WENDAMEEN LAID UP AT CITY ISLAND, NY, AUTUMN 1933... NOT TO BE RECOMMISSIONED UNTIL 1990!